Wooden Rocking Horse. A craft project. 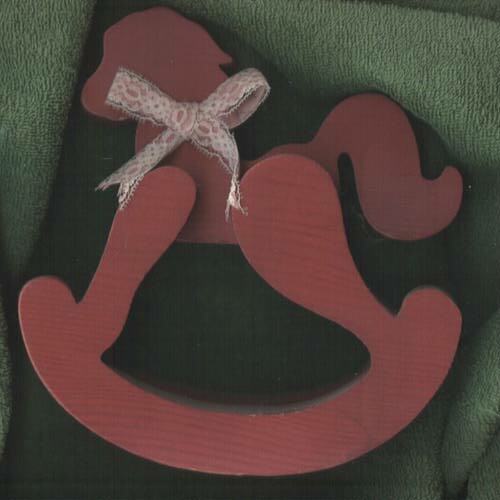 A wooden rocking horse project you can create. This Fancy wooden rocking horse is made from only three pieces of 1 inch thick lumber (not really that thick, but that's what the lumber companies call it.) plus a spacer between the rockers for support. Cut out two rockers exactly the same. Cut the horse body, head and tail piece. Hidden behind the bow are three notches in the wood that are the main--you can see the first and beginning of the second. The belly section is straight and flat on mine. If you print this page, you will have the basic pattern. You may have to shrink or enlarge it, but it should be really simple to do. Cut and stain or paint the color you want, then use a good quality wood glue to put the pieces together. Remember to put a small wooden spacer/support between the rockers at the point they touch the "ground" or in this picture, in the center at the very bottom. This is just a pattern and an idea. You need the minimal expertise to do the cutting and wood work required to make this into a masterpiece. This is Mac-n-Stuff's Frugal Living Page for wooden horses.